BOSTON, MA -- We've reached the holiday break in the 2017-18 Eastern Hockey League Premier (EHLP) regular season schedule. This past weekend featured all 13 EHLP teams in action, and plenty of worthy candidates for our final set of weekly honors in 2017. 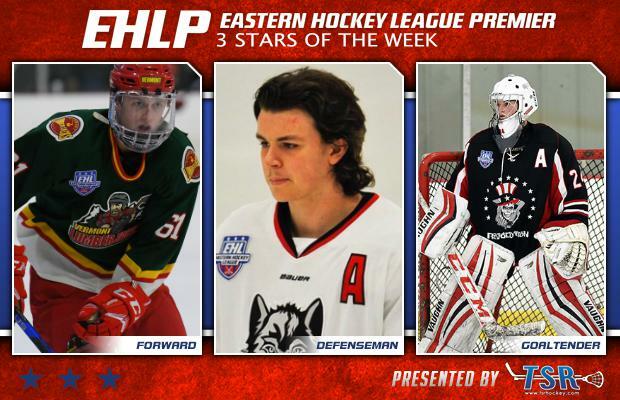 The EHLP is pleased to announce that Skylar Pettingill (Vermont Lumberjacks), Nathan Trull (New England Wolves), and Chad Simmerman (Philadelphia Revolution) have been named the TSR Hockey Stars of the Week. It's now time for all of our players and coaches to recharge the batteries for the final stretch of the regular season. 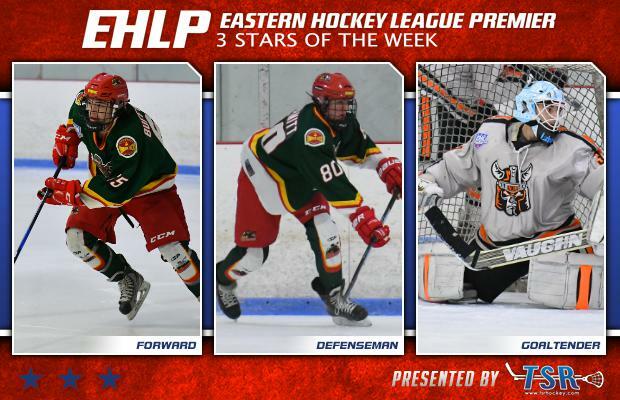 The EHLP action will return on Friday, January 5th, and the next set of TSR Hockey Stars of the Week will be released on Monday, January 8th at Noon. Catch the EHLP action all season long on HockeyTV. Pettingill and the Lumberjacks won both of their games this past weekend against the Walpole Express. The forward led the way with 8 goals including a 6-goal outburst on Monday. The '99 now has 15 goals on the season, along with 6 assists, and is now 3rd on the Lumberjacks in goal category. After the winter break, Pettingill and the Lumberjacks will continue their 4-game series with the Express with a pair of home games in Burlington, VT.
Trull and the Wolves won both of their games this past weekend against the New Jersey 87s. The defensemen tallied 4 goals and 3 assists in the 2 games, including an assist on the overtime winner on Sunday. The ’98 leads all defensemen on the Wolves in both the goal and point category, with 5 goals and 10 points on the season. After the winter break, the Wolves will get back to work with a pair of games against the Valley Jr. Warriors. Simmerman and the Revolution won both of their games this past weekend against the Jersey Wildcats, with the ’99 netminder between the pipes for the shutout win on Saturday. The goaltender stopped all 42 shots that came his way, earning his first shutout of the season. With the win, Simmerman is now 7-4-0 on the season with a 3.05 GAA and a .911 save percentage. After the 2-week winter break, the Revolution will head on the road for a pair of games with the New York Applecore followed by a matchup at Regency Sports Rink against the Central Penn Panthers the very next day. The EHLP would also like to recognize a pair of honorable mentions this week starting with Bryce Ricker of the New England Wolves. Ricker had 3 goals and 2 assists over the weekend in both of his team's wins. Alec Dugan of the New Jersey Renegades recorded a 4-goal game against the New York Applecore this past Saturday and tallied a total of 6 points in the weekend sweep.